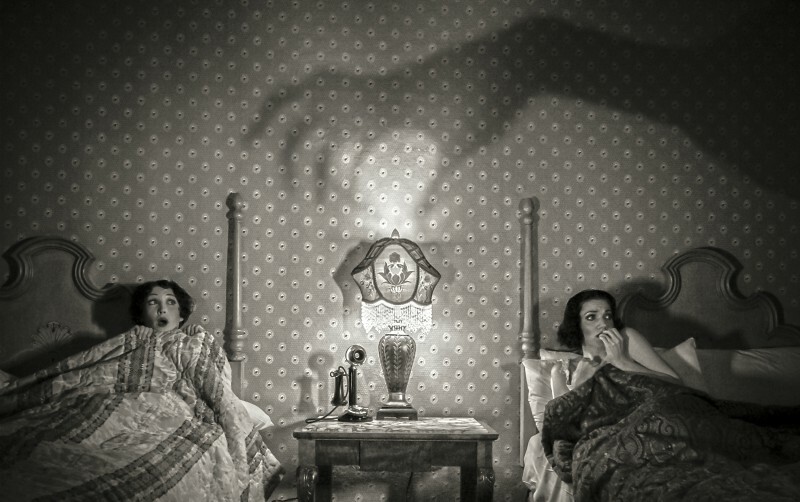 Photographer and author Craig Owens refers to himself as a “reluctant believer in the paranormal.” But he’s confident that in 2009, he saw a ghost. 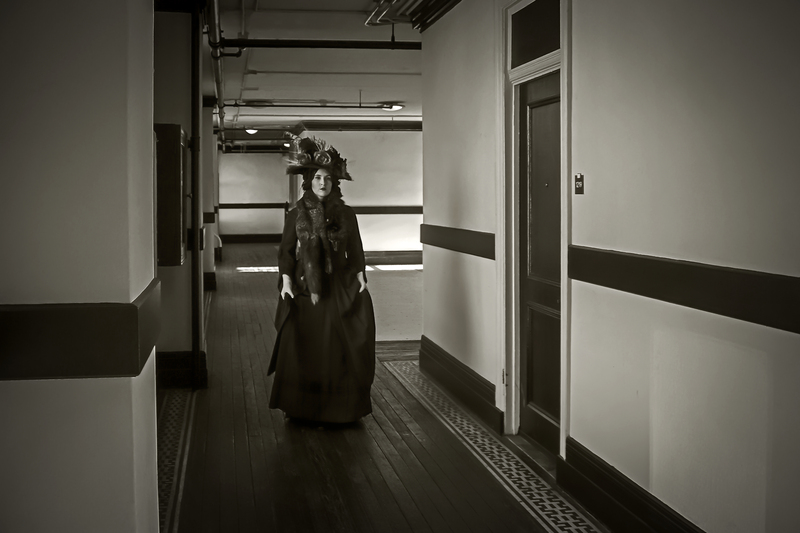 His project became to investigate the veracity of the hotels’ various legends, to uncover previously unknown details about their histories, and to use the hotels’ most beautiful, most “haunted” spaces as sets for a series of staged photos of models in period dress. The hotels aren’t backdrops but, rather, characters in the photos, which he’s compiled, along with his historical research, in the recently released book Haunted by History, Vol. 1. He and his crew were shooting at the Mission Inn in Riverside when Owens says he saw a “shadow person” for the first time. According to Owens, it was an inky-black, two-dimensional figure—roughly five-foot-two—wearing a cowl. Once the figure caught Owens’s eye, it immediately darted around a corner. Model Ruby Mae Collins in “Lade in Black” at Hotel Alexandria in downtown L.A.
Over the course of roughly six years, Owens and his crew stayed overnight and shot at 16 SoCal hotels, 8 of which are featured in Haunted by History, Vol. 1: Hotel del Coronado and Julian Gold Rush Hotel in San Diego County; Victorian Rose B&B and Wyndham Garden Pierpont Inn in Ventura; Mission Inn in Riverside; Hotel Alexandria in downtown L.A.; Banning House Lodge on Catalina Island; and Glen Tavern Inn in Santa Paula. Owens didn’t have paranormal experiences in all of the hotels he visited, but otherwise inexplicable stuff happened in a lot of them. At the Pierpont Inn, Owens says doors opened and closed at will, and, after shooting wrapped, a recording device picked up the sound of women’s high heels walking from one end of the corridor to the other, entering the bathroom, but never emerging. At the Hotel del Coronado, Owens says a recorder captured voices, footsteps, and a loud crash inside the room after the shoot (he stresses that it was November, the hotel’s off season). And at Palomar Inn in Temecula, Owens says he accidentally photographed a humanoid entity in a pinstripe suit swiping travel brochures from a parlor table. He also claims to have discovered that the Julian Gold Rush hotel was established in 1902, despite that all current brochures and periodicals date it to 1897. That might not sound like a blockbuster revelation, but it’s a step toward fostering a more accurate, more complete understanding of the region and its past—whether or not you believe in ghosts. “There’s a lot of mystery in history,” Owens says. He’s cracking the case one hotel at a time. Craig Owens appears for a podcast taping and book signing with LA Meekly and Bizarre Los Angeles at Bearded Lady’s Mystic Museum, 3204 W. Magnolia Blvd., Burbank; Sat., Jan. 20, 1-4 p.m.; free.